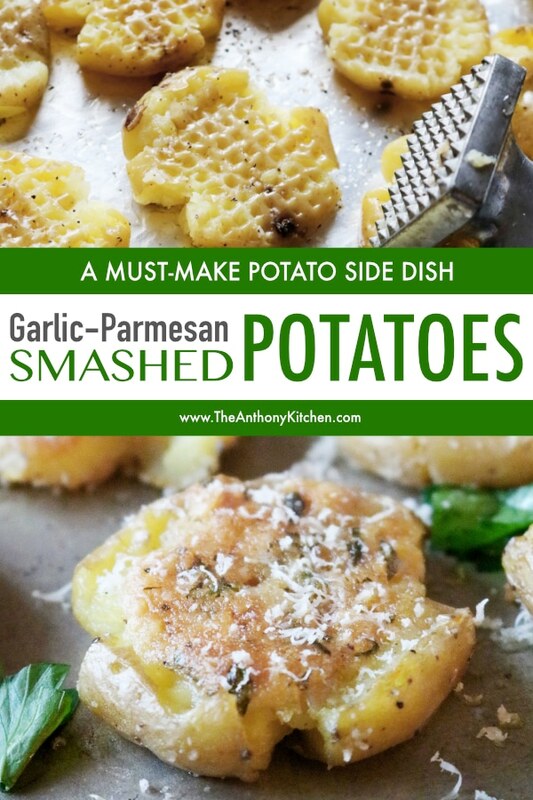 A smashed potatoes recipe featuring baby gold potatoes (or red potatoes) smashed and smeared with a garlic-Parmesan butter, then roasted to crispy perfection. As a mom who likes to eat, I am constantly on the hunt for fun side dish ideas to keep things fresh and fun for the family…well, and also for myself. Cause really, if we’re the ones investing the time to cook it, don’t ya think we deserve a little reward at the end? For me, the best rewards come in the form of carbs, gift cards are nice too, I guess, but carbs are much easier to obtain around this place. These days, I’m currently accepting payment for dinnertime efforts in the form of Garlic-Parmesan Roasted Smashed Potatoes. I had a vague idea as to how a smashed potatoes recipe worked, and after a little research, I was more than confident that any one of us moms could slam out a batch of roasted smashed potatoes regardless of our kitchen skillset. So, if this is a side dish that has ever bothered to intimidate you, rest assured. You got this. 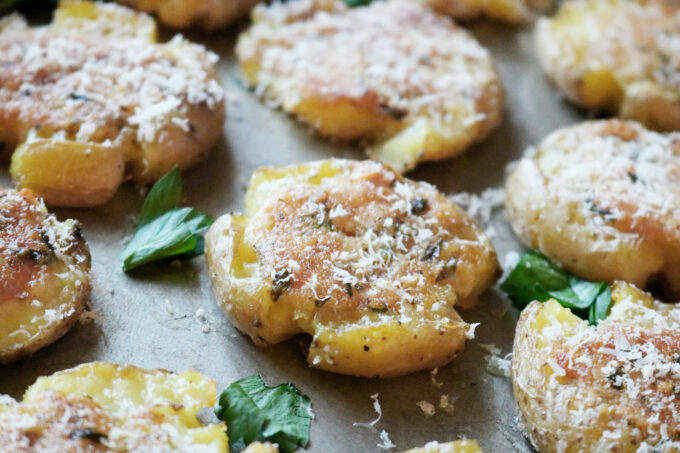 All smashed potatoes recipes begin with small potatoes. Have you ever noticed the letters on bags of potatoes? This indicates the size of the potatoes; “A” being about 2 1/2″ in diameter and “C” being less than 1 1/2″ in diameter. 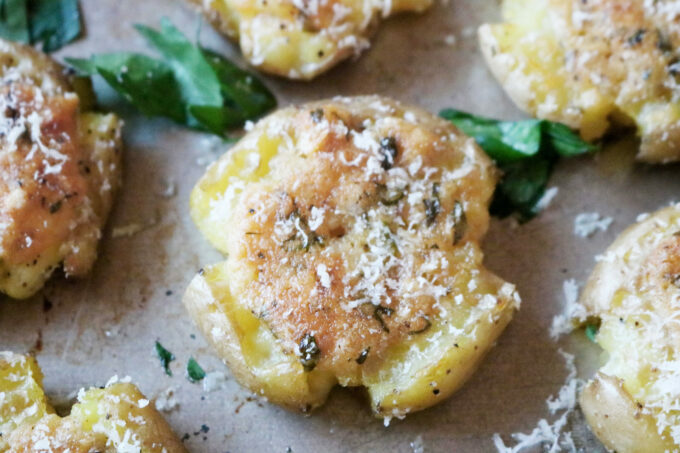 For this smashed potatoes recipe, we’ll actually be using a potato called Baby Dutch Yellow Potatoes, these are about 3/4″ in diameter and you can find them along with the other potatoes at your grocery store. However, if you can’t find them size “C” red potatoes would also be completely sufficient. You just don’t want to go too large in size, as the circumference of each potato will almost double after smashing, not to mention to the smaller potatoes tend to round out nicely when smashed. Actually, I guess I did mention it, huh? Moving on. 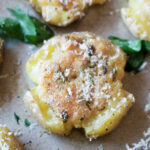 One of most alluring things about smashed potatoes is their creamy center. Potatoes with exceedingly creamy interiors are within both the gold/yellow potato family and the red potato family. Listen, I was seriously irritated about this step, but you can’t make smashed potatoes without boiling them first. The good thing is, boiling water and potatoes is pretty stink’n easy. The waiting is the hardest part. You’ll boil your potatoes for about 20 minutes, just until fork tender, and drain them from the water. Now, it’s time to release some aggressions…almost. 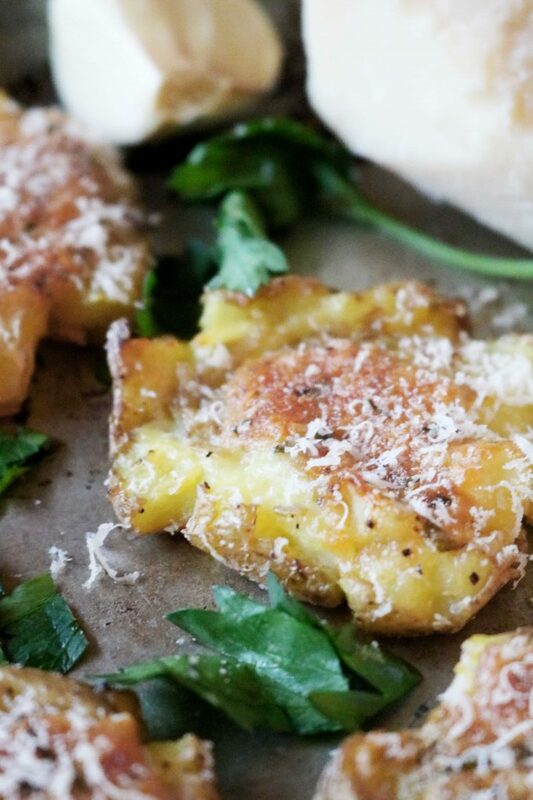 This is not your average smashed potatoes recipe. 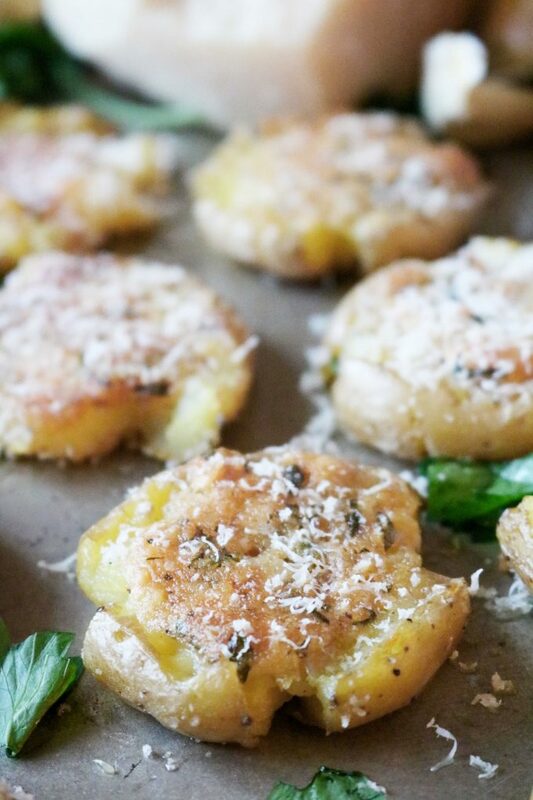 This is a garlic-Parmesan roasted smashed potato recipe. The garlic-Parmesan comes in the form of a quick and easy garlic butter. To make the garlic butter, similar to a homemade garlic bread spread, you’ll begin with a combination of oil and butter. Butter for flavor, oil to keep them from burning. Then, in goes the freshly minced garlic, the fresh parsley (optional, but definitely a nice touch), grated Parmesan cheese, a little salt and a hit of black pepper. Now, I don’t want to alarm you or anything, but my friend, you’ve just made a compound butter…and it was super easy. Wait, wait, wait. Hold up. Sorry guys. Promise we’re gonna get there, but just one more thing first. Y’all ready to smash some potatoes, or what? I’ll bet you are. 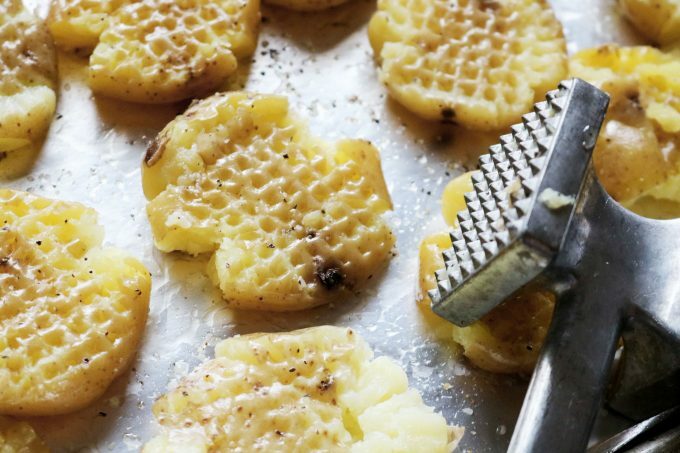 Place your potatoes on a work surface or a rimmed sheet pan lined with aluminum foil, and ready your smasher. You could use a rolling pin, a fork, the bottom of a cup (not glass), or my favorite, the meat tenderizer. The tenderizer makes all these wonderful dimples and crevices in the potatoes and allows that garlic-Parmesan spread to seep on in. When it comes to smashing the potatoes, try not to take out too much aggression. You want to just barely tap them to flatten them out. No need to send spuds flying all over the kitchen…unless it’s just been that kind of day. To keep the potatoes nice and circular, I encompass them in a little “OK” gesture with my fingers and tap with the tenderizer until just right. After the potatoes are transformed into smashed potatoes, it’s time to give ’em a good smear with that delectable garlic-Parmesan spread, and it’s on to roasting. Notice I didn’t say bake the smashed potatoes? No, I said roast. For two reasons, the first being we are going to be sure to leave space between each potato. This will allow heat/air to circulate not only over the potatoes but around them as well. In Layman’s terms, we are seriously increasing the crispy factor here, folks. Secondly, we are cooking these bad boys at 400°. Remember that protective oil spiel I was given earlier? This is precisely where that comes in. After first bite, it was clear to me why this whole smashed potato recipe fad took off, and has only kept on flying since. This smashed potatoes recipe is like little bites of garlic bread heaven, only creamier and without the gluten…not that I have anything against gluten. So even though there’s that annoying “boil before you smash” aspect to the recipe, there is most definitely a reward at the end of the tunnel, and one that is absolutely worth your time. Please, enjoy. Loaded Mashed Potato Casserole features buttery mashed potatoes with cream cheese, crispy thick-cut, bacon, freshly grated Cheddar, and chopped green onions. The perfect make-ahead side dish casserole! 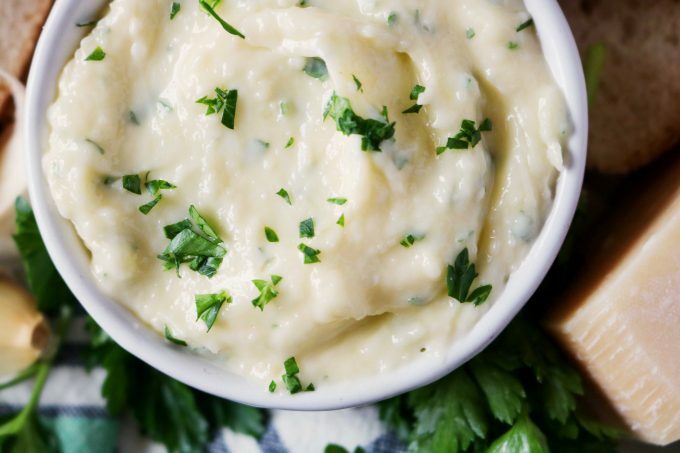 The Best Mashed Potatoes Recipe is easier than you think! These classic mashed potatoes are made extra smooth and creamy thanks to a couple of simple ingredients, and the trick to the lightest, fluffiest potatoes ever! Twice-Baked Potatoes with Cheddar and Bacon are the best way to eat a loaded baked potato! Made with cream cheese, Cheddar, bacon, and chives! Cheesy Mashed Potatoes feature creamy mashed potatoes with an über cheesy makeover! With three kinds of cheeses, these potatoes are baked until hot and bubbly and served up in casserole form for the ultimate comfort food side dish! Cheesy Bacon Ranch Potatoes require no dressing and no packet! Just a little seasoning and you’ve got a perfect batch of crispy, oven-baked Cheesy Bacon Ranch Potatoes. A smashed potato recipe featuring baby gold potatoes (or red potatoes) smashed and smeared with a garlic-Parmesan butter, then roasted to crispy perfection. Preheat the oven to 400° and have ready two rimmed sheet pans lined with nonstick aluminum foil. Set aside until ready to use. Add the rinsed potatoes to a large pot and fill 2/3's of the way full with water. Place over high heat and bring to a boil. Boil for about 20 minutes or until fork tender. Drain the potatoes in a colander in the sink, and rinse with cool running water until no longer steaming. Pat the potatoes dry with a clean dish towel and transfer to a sheet pan. Drizzle the potatoes with 1 1/2 tablespoons of oil and sprinkle with 1 teaspoon Kosher salt, and a 1/2 teaspoon black pepper. Toss to combine, then, transfer half of the potatoes to the second sheet pan. Apply gentle pressure to each potato to smash down. See notes if needed. Combine butter, 2 tablespoons canola oil, Parmesan cheese, minced garlic, 1/2 teaspoon Kosher salt, and 1/4 teaspoon pepper in a small bowl and whisk to combine. Alternatively (for a smoother spread) add the ingredients into a miniature food processor and process until well combined. Spread a scant 1/2 teaspoon worth of garlic-Parmesan spread across the surface of each potato, and bake for 25-30 minutes (or until crisp and golden brown), swapping out the placement of the sheet pans about halfway through the cooking process. Use either a meat tenderizer, a fork, or the flat bottom of cup (not glass) to smash the potatoes. To keep the potatoes in a round shape, make the "OK" gesture with your fingers and tap carefully with the tenderizer until just right. More information on the size of potatoes can be found at the NNPGA website. Wow, these look so good…drooling over here! I’d have to switch up the butter and parmesan to make them vegan but I think I can do that! Thanks for the yummy idea! Thank you! These were excellent. I served them with Delmonico steaks and used the leftover ones for breakfast with scrambled eggs and sausage. We thoroughly enjoyed them.